The Minimono represents a new breed of boat: a mini-sized model equipped with a brushless motor and an ESC designed for a LiPo battery! 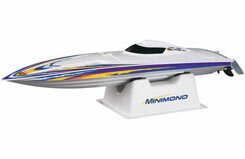 This advanced power system makes the Minimono one fast boat that's lots of fun to drive. Its smaller size and responsive handling let you race on smaller bodies of water, and it's very affordable to operate too!